I never liked rogues before and now I think I know why. Rogues used to have only pierce damage for them, everything else in their mastery didn't work for various reasons. With DOTs and traps fixed, there are now at least two more ways to play this mastery. 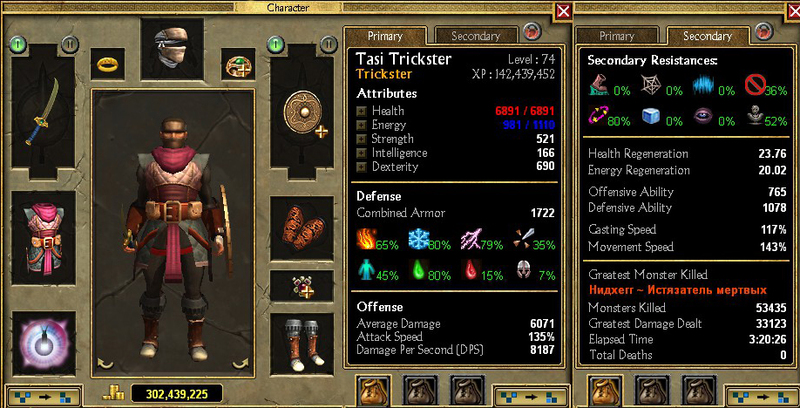 This trickster is a full rogue build using rune mastery for support only, while relying on poison, bleed and traps to do damage. It uses throwing weapons or occasionally melee weapons together with skills like throwing knives and poison gas bomb. Rune is chosen for the quality of its support skills, there is a debuff (seal of fate), crowd control blocking path (menhir wall) and resistances (rune of life). Due to this full rogue focus it does not have to be a trickster but can also be built as illusionist or perhaps a magican. Poison and bleed do no damage to certain types of mobs, constructs and ghosts, and only do marginal damage to other undead who in Anniversary edition got 70% poison absorbtion instead of 100%+ resist. Piercing damage which is another rogue mastery specialty also does poor against these mobs. Traps, however, that were made into "pets" in Anniversary, can carry any damage type from pet jewellery. Physical or elemental or vitality, in practice physical is just enough for killing undead and constructs. Calculated strike - This is an auto-attack replacer skill to start the game with as one pointer, necessary for early game progression. High direct damage on fourth hit can help kill any mobs at any stage of the game too. Lucky hit makes it more valuable with its chance to do high bleed damage. Lay trap - Taken early, leveled together with its modifiers steadily but persistently over first four acts of normal. Requires pet damage jewellery to be good, thus used together with 2-3 pet items. Traps are more consistent than wolves and do not need support, so minimal pet jewellery is just fine. I was wearing just two pet items in the end. Its needed to deal with undead and constructs after all, not being main focus of the build. Rapid construction modifier at ultimate rank (max +4) reduces skill recharge to 0. Poison gas bomb - "Spell" that should be taken early at first opportunity and is a priority to level, it is the main nuke in the build, used to destroy packs of mobs. Fast recharge even without recharge reduction gear makes it a good early game nuke. Shrapnel may be left as one pointer until late. Throwing knives - One more damage spell, does bleeding damage and carries poison from equipment (except weapon) and envenom weapon. Can be left as one pointer until early to mid epic, but only to focus on something else as this is also an important damage skill. Knives have much longer range than throwing weapons and with flurry of knives can hit multiple targets, thus having its own use not covered by normal attack. Carrying poison, slow and confusion from envenom weapon this is part damage part crowd control skill. At ultimate rank skill has 0 recharge time. Lethal strike - This is how melee pierce rogues suicide themselves on reflect. Thanks to its modifier mortal wound amplifying poison and bleed by huge % poison rogues can try it too. Main skill is best left at 1 point, modifier maxed if possible (and if you were even going to use melee weapons). Flash powder - Crowd control skill that applies fumble and confusion, useful to prevent melee mobs from swarming you or put fumble on a boss. Envenom weapon - Characteristic rogue buff that is of course fully maxed in this build. Adds poison damage to attacks, improves %poison damage globally, debuffs mobs with slow and low chance of confusion. Provides damage, and crowd control by means of just attacking mobs. Anatomy - simple passive boosting %bleed damage. Can be left as one pointer until very late. Disarm traps - boosts % racial damage to constructs. 1 pt is enough if any, your damage is not your traps damage and you will mostly use traps to kill constructs. Seal of fate - Very slow-to-fire nuke with high elemental damage (main), bleed damage and debuff (aftershock). Used as one pointer with maxed aftershock to debuff. Can easily hit not very agile bosses and immobile ranged mobs. To hit melee mobs with it, they are best blocked and aggroed by menhir wall first. Menhir wall - A row of rocks that block path. Most efficient way of crowd control in the game, there is no immunity to this and it can block bosses. Rocks can be destroyed, but their hp grows significantly with points invested. Left as one pointer to be maxed late however, as there are other more important things to take. Energy armor - Huge flat damage absorbtion that protects against physical, pierce and bleed. Requires either huge mana pool or lots of mana cost reduction. When having neither its still good to keep a few points in it. Rune of life - A castable duration buff giving vitality and bleed resistances. Runeword: feather - Reduces requirements for weapons and provides some OA. Can help using heavy shields but otherwise not critical. 1 point. Runeword: absorb - Reduced block recovery makes block more efficient, with top shields you will hear it blocking all the time. Energy absorb helps to restore mana. 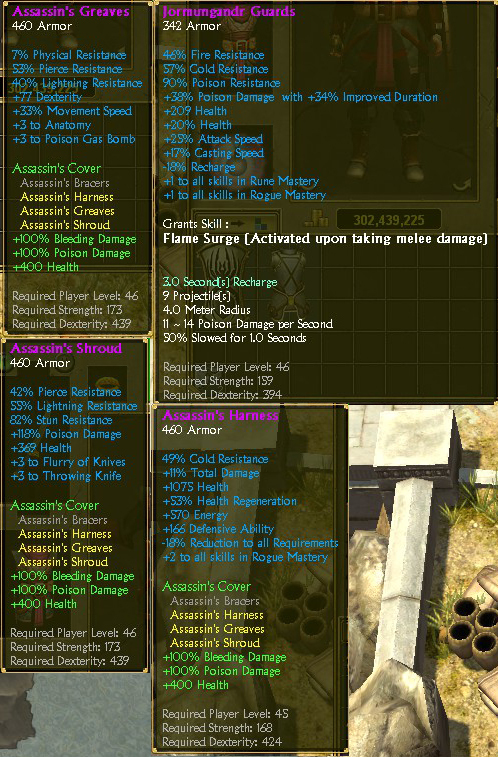 Sacred rage - Upon reaching low health grants 20% damage absorbtion and together with its modifier also monster damage reduction. Not much absorbtion and damage reduction in rather short radius for short duration, so not investing much in it. Reckless offense - Allows dual-wielding weapons, including thrown. Not needed if you weren't planning to. Guardian stones - A pet that is immobile and fires at mobs that come near. Attacks do not convey pet damage from gear, so if you don't have sources of global %pet damage, its damage will stay at what is listed in the tooltip (terrible). Good to impress early game bosses, but I fail to find a use for it in late game. Stat distribution is strength : dexterity 1 : 1 until level 60, then all into dexterity. 6 quest reward points go into energy and 6 in health (all normal and epic), or all 12 into energy for energy armor. Start with rogue mastery and pick calculated strike and envenom weapon as first skills. Use a spear with calculated strike, and some ranged weapon on swap. Work on the mastery bar to get poison gas bomb and traps. Poison gas bomb is super efficient at clearing packs at low levels and will even wipe out undead just as easily as living (except ghosts) until end of normal, if not halfway into epic. This skill is the first priority to max. Traps won't be very useful with the first few points in them and until rapid construction is maxed, so there is no need to bother with pet jewellery until act II normal. They will become more practical by end of act II - beginning of act III and will be already needed there too, so its best to plan ahead and put some points in them every now and then. They are the second priority to max. Envenom weapon is the third priority to max. Maxing both masteries can usually be done around level 40, if putting 3 points to mastery bar and 3 points into skills every other level. Next, skills are maxed in an order traps - envenom weapon - rune of life - aftershock - throwing knives - flash powder. The build is mostly finished by level 55. Poison rogue has distinctive contactless tactic made possible by poison gas bomb and traps. These two skills have unlimited range so you can hurl them wherever you want within direct line of sight, and kill packs before they see you. Withing shorter range it will use menhir wall followed by same gas bomb or throwing knives for packs, or just hitting individual mobs with throwing weapon. 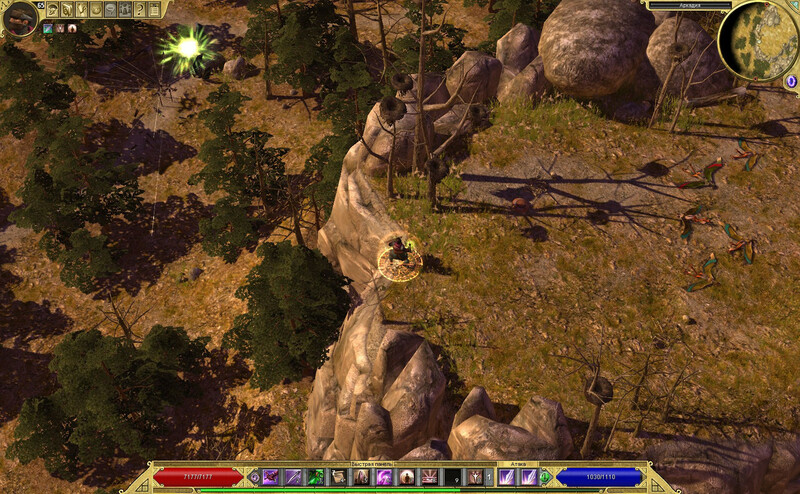 DOTs in Titan Quest do not stack, they are good at killing mobs but slow at bosses, though placing few traps can still speed up boss fights. There are several mobs and locations worth noting. Reflect mobs can be very dangerous when you have lots of poison damage. Using something like Gorgon's Edge on mobs like draconian mages is a terrible idea. Use traps to deal with them. Reflect also demands 80% poison resistance in endgame at all times. Not an easy thing to do I know, but I will note a couple of simpler solutions in gear section. Yggdrasil area has mobs with very high projectile resistance. Mobs get additional proj resist on epic and legendary, so these mobs get to 100% in legendary. Add to this that they all have moderate reflect too. I don't know if its working as intended or an oversight, but for a build like this one relying on projectiles mostly it is a PITA. Poison gas bomb works, but a melee weapon is also needed in legendary. Just don't use lethal strike on them. Get a stack of health potions before going there too. Ghosts are not affected by either poison or bleed. They also have 60% physical and pierce damage absorbtion that makes them a harder target for physical traps. They are the reason traps are needed early and before you meet lots of them (act IV lost souls). When dealing with them, use debuffing skills and attacks. Winds of Asphodele in particular is better for this task than Gorgon's Edge, but any other source is useful. A poison rogue needs some + skills, +4 rogue is mandatory (because traps, throwing knives), rune can be left at lower but having both masteries maxed is always good. Around 400% poison damage. I consider bleed secondary, but having some is useful with so many bleed skills. My character has 500% poison and can oneshot any mob with throwing knives or gas bomb up to legendary volcanic wyrm, cyclops and yotuns. With Gorgons Edge, he oneshots legendary yotuns too. So it is actually a very high number, but then the lower you have it, the longer you have to wait for mobs to die, running around in circles is fun up to a certain limit. Mana regen is needed to use all the expensive spells, energy absorb and mana leech can also help. 2-3 items with pet damage for traps, this is most common on magic and rare jewellery but can also be found on several strength based armor pieces like gloves and boots. DA and resistances as always. Where to get DA. This is simple, build is lucky to be dexterity based and every one point of dex is one point of DA. Dexterity can bring around 700 or more than 1000 DA alone. If you scale dexterity with items getting 1000 isnt hard, but these items are not common. Star of Ishtar artifact has 20%, then there are also Sigil of Bast and Symbol of the Polymath. Sigurd courage relic has 9%. A number of rogue related items have high flat dexterity. 1000 DA is sufficient number for endgame when you can keep mobs at distance. 1200 is a more comfortable level though. Additional DA can be procured from relics. Guan Yu grace and Shade of Hector, both with DA completion. Monkey King can have 75 DA completion. Assasin's cover is one of the convenient ways to get that when you happen to have the items, my character uses 3 out of 4. Ismene's helm has 40% along with 80% poison resist. Common MI that drops from lamias in act IV that can also help to solve the issue with poison resist. Jormungandr guards happen to have 33% along with 90% poison resist, +1 rogue and +1 rune. Can similarly help with poison resist. Envenom weapon provides 170% poison damage and is something every poison rogue is going to have. Dexterity can provide 100-150% (100% per 600 points). 100% is guaranted then, extra 50% can be procured from dexterity scaling, see "where to get DA" above on this. Items with high flat mana regen. Puppetmaster's rare necklaces, Eldhrimnir stew relic (with rare chest), ring of Veleda, golden shield of Pelaron, Apples of Idun artifact. you really hate int huh? Why would I even want elemental damage here? And a point sink like rune weapon when I need these points elsewhere. Archmages clasp is nice except it does not have poison res. Or skills. How does Rune Weapon affect throwing knifes? This looks like an actually fun build! And I see you made it to legendary with no deaths, too. Very nice. Blade Honing will boost piercing dmg for your character and traps, Throwing Knives too. Why don't you using it? You should using " additional elemental dmg " item for pets when facing undead type enemies to deal with them easily. Using Poison Gas Bomb Only you can kill x24 Typhon ( Massbossess) Easily. Only if you attack with it and then it only lasts 3 seconds per stack. Seems like too much effort for little bit of gain. However, I’d max frightening power even if you don’t max rage. Absorption gets high and a 77% fear of you are caught with your pants down. Also, if you are using calculated strike, why not add runeword explode for procs? They provide free elemental damage. Speaking of elemental damage, spots where poison and pierce are weak, you could try Guardian Stones. Plus, they benefit from your pet gear and are devices so keep with trap theme. Btw, I love reading people’s in depth builds. These things should be put in a compendium with botes summoner mage and others. Only if you attack with it and then it only lasts 3 seconds per stack. edit 2: lol at typhon fight.. but the road to typhon was what i was referring to... "thread lightly, and with speed"
By how much? I can't see flat damage number of the ultimate rank skill in calc but rank 6/6 is 15 flat. Single allfather's is 110 flat. Doesn't seem like worth the effort. For the character himself too: out of sources of pierce damage scaling he has ~700 dex, thats actually +70% pierce damage. And nothing else. Without appropriate scaling it will be a change like 500 pierce per knife -> 530 pierce per knife. I had this idea, but quickly discarded it. Why? 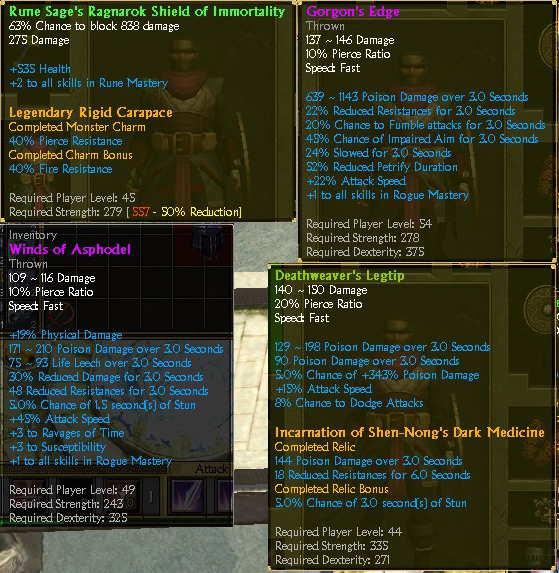 Consider that all mobs get 60% elemental resist in legendary. Without debuff it is the same as having 60% damage absorbtion like ghosts do to physical. It can be removed by debuff unlike absorbtion, but to do so you need to hit mobs with seal of fate or asphodel first. So you're making your elemental traps do against any mob type like mine currently perform against ghosts only, unless you debuff. Elemental traps may be a good recipe for illusionist because plague is so much simpler to use on any monster group. - 52 minute duration. Em. Um. Can you please tell in a few sentences whatever you meant to say? Or if you want to show something, tell me the exact time where it appears in the video. 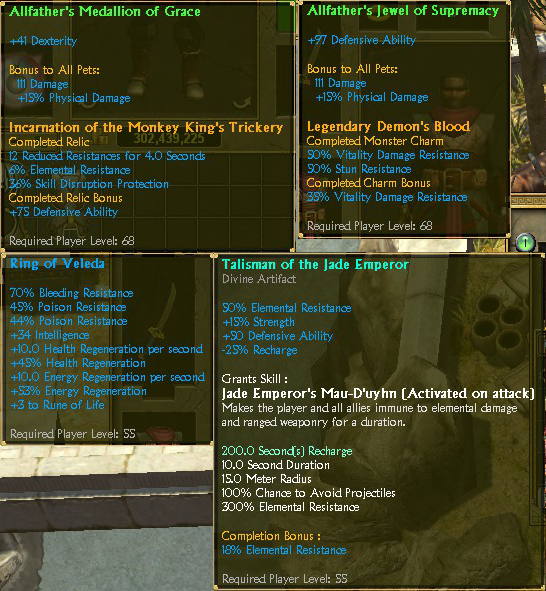 - You can equipped two Green ring which add Monkey King's Trickery and using Throwing Knives to reduced resistances enemies. - That video is 3 run Typhon massboss, which ~15' per run if not die any time, 15'/24Typhons, 3 run 72Typhons. This way to kill Typhon in Massbosses is safe, quick and easy to do. I think I'm not getting the message of that video. Killing bosses from stairs had been an anecdote about TQ difficulty. Increased game speed must be a good option when you want to kill bosses with gas bomb. On flat pierce stacking on knives: brigand has auras and temporary buffs to scale %pierce, trickster has nothing. With basic stats knives are pointless as a source of direct damage. Page created in 0.212 seconds with 32 queries.